Here's the key question policy-wise: Can we start to ignore the consequences of exceeding 4.5C for a doubling? What percentage should we be looking for to make such a decision? And all of this begs the question of exactly what negative effects we might get at 3C or even lower. My impression is that the science in all sorts of areas seems to be tending toward more harm with smaller temp increases. Then there's the other complicating question of how likely it is we will reach doubling and if so when. At last the post we've been waiting for... :-) But where is the report on the press conf? BTW (to save me reading the paper again) suppose you are fairly strict instead of generous, what is your upper 5% conf point? IMO, there are plenty of ethical, economic, political and environmental reasons for trying to minimise our overall environmental footprint, including fossil fuel consumption as a significant component of that. Almost all of these reasons apply even if climate sensitivity is 0C, let alone a realistic estimate of 3C. IMO it's not particularly sensible to frame the entire issue in terms of the small chance of "climate catastrophe" because then we risk having the rug abruptly pulled out from under our policies when someone proves that the catastrophe is less likely than was previously thought :-) Also, arguing over the precise threshold probability for particular outcomes risks turning into angels-on-pins stuff. james, which journal? and come on, M$ Word isn't that bad and LaTeX is sooooo 2005! I should already know the answer to this, but does "doubling" generally refer to doubling of natural CO2 levels or doubling from current levels? If natural is the baseline, it seems quite possible that we will more than double CO2 by 2100. Doubling is doubling, wherever you start from (roughly speaking). So 550ppm will be about 3C warmer than 275ppm, and unless we work at reducing emissions, I wouldn't be very surprised to see that level of CO2 at or before 2100 (not that I'll be around at that time...). But note that this temperature rise is for the equilibrium state, so we wouldn't expect to feel the full effect until a few decades after hitting the magic number (thermal inertial). Also, this is all assuming other forcings are unchanged - in practice, sulphate emissions may offset some of the warming, methane may increase it (etc). Since the affect of CO2, indeed any atmospheric greenhouse gas is logarithmic in it's affect. That is each subsequent doubling of CO2 has half the affect, how can you say that any doubling will have 3C forcing? CO2 warms the earth by preventing energy in the form of photons of certain frequencies from escaping into space. Since the supply of these photons is by nature limited, each increase in CO2 acts only on those photons which were not blocked by the previous increases. IE, each increase works on steadily shrinking supply of photons. I don't agree with your interpretation of "logarithmic". According to Section 1.3.1 of the IPCC's Third Assessment Report, each doubling of CO-2 concentration adds an additional 4 W/m**2 to the rediative forcing. So each additional doubling in CO-2 adds the same (not half) the effect, in terms of radiative forcing. Going further with the point made in that section: What is happening is that the sides of the absorption band (the "wings") are getting blocked, which were hardly affected before. So that, although it's true that the number of photons in the IR population is decreasing, in the first several rounds of doubling, you are not close to running out them, so the "diminishing returns" concept does not apply. Another point is that the amount of termperature increase is not linear in the amount of forcing. As I understand it, the transport of IR out of the earth would be equal to the "original" amount (a reference value), minus the radiative forcing. As the transport of radiation outward becomes less efficient, the temperature of the earth's surface must increase to reach a power balance with the absorbed light from the sun. I don't think this is linear! Finally, even if the increase is "only" 3 degrees Celsius, remember that this is an increase in the average global temperature. The difference between our current average global temperature and the most recent Ice Age is only 5 degrees Celsius. What a difference that made! I would like to focus on what James said about sulphate aerosols acting as a cooling agent. I recall that about three years ago the IPCC said that these aerosols were counteracting global warming, but that as regulatory programs to counteract acid rain were fully implemented, the sulphur compounds would decrease, and the warming from the CO2 emissions would be unconstrained. I recall that in 1990, just before the US Congress passed the 1990 Clean Air Act Amendments, including establishing the first Acid Rain regulations, the National Acid Precipitation Assessment Program (NAPAP) was published. It represented ten years of study by hundreds of scientists at a cost of $500 million (US), and the conclusion was that acid rain was only a problem for a few lakes in the Adirondack mountains of northern New York State. Despite that finding, Congress enacted the program, and set the US on the course of cutting down on sulphur emissions from coal fired power plants. The result is that we have a program that is reducing sulphur emissions from power plants which do NOT cause a significant problem with acid rain, and by doing so, it is EXACERBATING what may be a REAL problem with global warming. At the very least, the science indicates that we ought to consider cancelling the "acid rain" controls and take advantage of the cooling effect of the aerosols to buy us some time against greenhouse warming. Perhaps one of the factors in the cooling that occurred from the 1930s to the 1970s was this aerosol pollution, counteracting the expected warming from CO2 emissions, and the warming since the 1970s is a direct result of air pollution regulations that have decreased emissions of all kinds of particulates. In effect, the major direct cause of global warming in the US may be the Environmental Protection Agency! If you would think about it for a minute, you would realize that the linear model you are proposing would require that the atmosphere generate energy. The forcing is energy from ground emissions that are being reflected back to the ground, rather than escaping into space. Once all of this radiation is reflected, there can be no further increases in the forcing. As the amount of CO2 increases, there is less energy escaping. So each increase in CO2 acts on a smaller and smaller amount of energy. The linear model is good for small changes in CO2. It fails utterly when you are attempting to quantify large changes. I really don't think any of this matters. It's largely a matter of perspective...but I'm personally more interested in forecasting what will (or may) happen, than in describing what has happened. surely we can't simply look at the CO2 and think that's all there is that is having an effect? From what I can tell the science of ecology, is even MORE complicated than quantum physics! If a 3 degrees C rise in temperatures is predicted (as a minimum), then what will that trigger? I have heard that this will trigger the release of millions of tonnes of methane from the sea bed and the Russian tundra (as it thaws) which in turn will speed up the warming. Surely the imperrative is to do something about our emissions of CO2 now, so that we don't see what happens? It's all very interesting as a scientific excercise (or as a model in a super-computer), but this shouldn't be carried over into the real world to see what happens and test these theories?! 3 degrees would be catastrophic for the majority of people on this planet and would lead to millions of deaths. 10 degrees would be a planet killer (because of all the other things that would then be triggered at that temperature). It's a bit like asking what would be the difference between putting 7 bullets into someones head compared to 4! The result will be a dead person either way! I certainly don't believe that 3C of warming will "lead to millions of deaths", and I don't think there is any scientific support for such a position. It will cause changes, for sure, and if we could stop all anthropogenic carbon emissions for free then I'd be all for it, but as things stand we have to consider the trade-offs between current economic growth and future climate changes, both of which contain uncertainties. I'd seen a glimpse of that at the AGU and wondered where the full paper was. Will probably blog it once I've had time to read it. I am curious why you did not reference Douglass and Knox which shows that the climate sensitivity estimate from Pinatubo is much smaller, and probably cannot be used to derive a 2XCO2 estimate because of the different processes involved in a volcanic eruption (see also Robock, Wigley et. al. and Douglass and Knox response to Robock and Wigley et. al. I think Douglass' stuff is rubbish (and no reviewer suggested it rated a mention). In more detail, the natural variability happened to oppose the Pinatubo cooling, so the forced response was actually greater than the observed change. And GCMs with much larger sensitivity than Douglass would allow, still simulate the cooling rather well. So although I would agree that this and other eruptions point towards moderate sensitivity, they by no means prove it is negligible. Can you explain why you think Douglass is rubbish? From my reading his is a simple, physical energy balance model that fits the data very well. Douglass completely ignored the ocean heat uptake, which is a huge red flag. Everyone knows that this is a major uncertainty, and every plausible climate model suggests it is a substantial effect. It is not credible that the authors and reviewers were not aware of this, assuming they have a rudimentary awareness of the field. Yet Douglass and Knox don't even mention it! You may not realise that GRL basically allows authors to pick their own reviewers, which means that complete nonsense occasionally gets through. They addressed that in their followup responses I linked to above. In fact the ocean heat uptake fit very neatly into their model. Once included, it made little difference to their estimates. No response? Do you agree then that Douglass is not "rubbish" as you put it? If so, how do you think inclusion of his results will modify your sensitivity estimate? Douglass do try to salvage their original work by claiming that they original error has negligible effect, but their apparent confusion between the ocean interior diffusion and the effective basin-wide diffusion (substantially larger, due to topographic effects over ridges and near edges, and convection) makes it pretty dubious. And using a quote from the SAR for something written in 2005 is decidedly odd. Modern estimates of the effective diffusion seem to agree with Wigley et al and disagree with Douglass. Modern estimates of the effective diffusion seem to agree with Wigley et al and disagree with Douglass. I am curious to which modern estimates you refer. Ledwell's 1998 SF6 tracer experiments established an eddy diffusion coefficient of around 10-5, which is what Douglass uses. Wigley uses values between 10 and 40 times that. The book "A Turbulent Ocean" by S A Thorpe has an interesting discussion on pages 39-40, which describes the smaller tracer-derived numbers as the correct "modern" value. Regardless, describing Douglass as "rubbish" because he used recent, published values for the eddy diffusion coefficient seems rather unfair. The model and analysis in Douglass is, in my opinion, an object lesson in parsimony. You also seem to be confusing the ocean interior diffusion with the basin average. They are not the same! Vertical mixing around the boundaries and over steep topography are far greater - Douglass's value refers to the extremal low value in the deep interior, not a representative average. Note also that he has already effectively claimed in the first paper that the ocean mixed layer is very shallow - so for the effective diffusion out of the bottom of that layer, he should use a diffusion coefficient appropriate for 50m depth or thereabouts, not 500m. No-one credible considers his analysis reasonable, and I guess that the reason he does not explicitly discuss the implied depths in his paper is that the inconsistency would be too stark. It is not "parsimonious" to ignore factors that are known to be important, and then produce a spurious and misleading argument to attempt to defend the initial error. Vertical mixing around the boundaries and over steep topography are far greater - Douglass's value refers to the extremal low value in the deep interior, not a representative average. The average depth of the ocean is 3,790m. Two thirds of the earth's surface is covered by ocean greater than 200m deep. Therefore, it is much more likely that the average diapycnal heat transfer of the ocean is determined by the interior than it is by the boundaries or regions of steep topography. Do you have references supporting your assertion to the contrary? "I guess that the reason he does not explicitly discuss the implied depths in his paper is that the inconsistency would be too stark." I doubt that is the reason. The original paper included no ocean heat-flux, and fit the data very well. You don't even need the model to see that a huge ocean-induced lag is unnecessary to explain the data. Just eyeballing the data, you can see the eruption, the response, and then the relaxation back to equilibrium with a lag of about 6 months. If there is a big ocean lag in there it is not significantly impacting the temperature response. Mugwump, you talk about the "average diapycnal heat transfer of the ocean", but what Douglass' revised model actually requires is the heat transfer out of the upper mixed layer, which must (according to his ~5 month time scale) be very shallow. However, in his revision, he did not use such a (shallow) heat transfer coefficient, but explicitly used a value appropriate to the ocean interior. Your comments about "huge ocean-induced lag" are just nonsense bluster. The rapid decay of the cold anomaly is (partly) because it is diffused downwards. It is perhaps excusable that you can't get your head around the physical behaviour of the climate system, but that doesn't mean that everyone else who has studied it is a moron who is missing your supposed insight. It is perhaps excusable that you can't get your head around the physical behaviour of the climate system, but that doesn't mean that everyone else who has studied it is a moron who is missing your supposed insight. What a surprisingly aggressive response to my question, which was simply: "Do you have references supporting your assertion that the average ocean heat flux is determined by 'Vertical mixing around the boundaries and over steep topography'"
It wasn't a rhetorical question. I am genuinely curious. And it goes directly to the heart of whether Douglass and Knox's (DK's) model makes sense. They came up with a neat modification (eq (3) and (4)) to their original model that allowed them to incorporate ocean heat uptake without changing the functional form of the model, hence all their original fits were still valid. So if they are wrong, either their basic model is wrong (which seems unlikely - it is just a simple energy balance model after all), or their choice of eddy diffusion coefficient is wrong. DK's analysis fails on its own premises. End of story. The diffusion out of their hypothesised thin mixed layer cannot be controlled by the diffusion coefficient in the thermocline because their mixed layer is far too thin to reach this thermocline, based on their own figures. I can't be bothered generating a reading list for you to learn about the difference between effective diffusion and the abyssal interior value, because it is actually not relevant to this simpler point above which directly refutes their analysis. However, a google search found a bunch of it very easily, which suggests you are more interested in wasting my time than actually learning. "The diffusion out of their hypothesised thin mixed layer cannot be controlled by the diffusion coefficient in the thermocline because their mixed layer is far too thin to reach this thermocline, based on their own figures." DK did not hypothesize a "thin mixed layer". They simply added a term representing heat flux into the ocean to their model and estimated how great that flux should be based on first principles. They freely admit that their's is an approximate treatment - the so-called "separability hypothesis" DQ = sDT - but that seems like a reasonable first-order model. So the argument just comes down to how great an additional heat flux out of the ocean you would expect from a peak temperature excursion of approximately -0.5C due to Pinatubo. Wigley et al claim it is of the order of 2W/m2, DK claim more like 0.25W/m2. 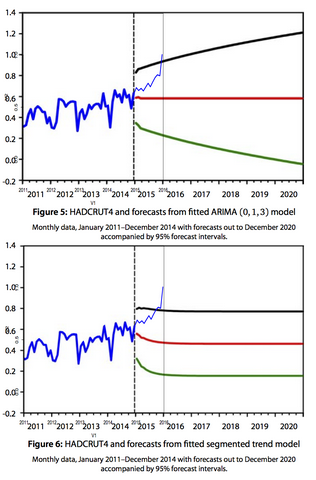 DK's estimate has the advantage that it does not rely on further modeling. My educated layman's physicist's gut (layman as far as climate science goes, not physics) tells me 2W/m2 out of the ocean seems pretty high given that the temperature difference is generated by a peak forcing of only -3.4W/m2 - it implies that the ocean response is of the same order as the atmospheric response, which seems unlikely given the "impedance mismatch" between the ocean and atmosphere. Of course DK could be wrong, but it just comes down to basic physics: what governs the ocean heat flux change. They argue the ocean heat flux change is proportional to the atmospheric temperature change, with a small constant of proportionality. "I can't be bothered generating a reading list for you to learn about the difference between effective diffusion and the abyssal interior value, because it is actually not relevant to this simpler point above which directly refutes their analysis." As above, I don't see how you have refuted them. "However, a google search found a bunch of it very easily, which suggests you are more interested in wasting my time than actually learning." I can assure you I am not trying to waste your time. I would have thought given the references I have already cited that it was obvious that I have indeed been doing my own research (eg - Thorpe above) to try to get to the bottom (no pun intended) of this. My main interest is in understanding what, if anything, we can say about climate sensitivity that does not rely on General Circulation Models. Hence, I would be most grateful if you could post the references you found. DK did not hypothesize a "thin mixed layer". As I said before, they did not explicitly provide a number for the depth of the surface layer in their analysis, most probably because it would destroy the credibility of their results. But a relaxation time scale of a few months requires a thin mixed layer because a thick one takes longer to warm up or cool down. Apologies if this is a dead thread, but does the PETM offer any constraints on climate sensitivity? Or is the sensitivity of the Eocene planet irrelevant to that of the modern one? I think there are enough uncertainties, including the magnitude of the forcing, response, and other boundary conditions, on top of the dubious relevance to the modern system, that it is hard to use directly. But there are certainly people working on all these things. Clim. Past Discuss., 7, C26–C31, 2011 www.clim-past-discuss.net/7/C26/2011/ © Author(s) 2011. This work is distributed under the Creative Commons Attribute 3.0 License. "... a novel way to calculate temperature and CO2 for the last 20 Myrs and explore the implications of this association, especially with regards to climate sensitivity.... Overall, the manuscript is in pretty good shape except for the discussion of climate sensitivity...."
Thanks, I saw the manuscript but didn't check though the sensitivity calc. I agree with the reviewer that it's a bit of a mess but expect it will get sorted out in the review process. I hope that CP will add "comment feeds" of some type to make it easier to keep up with the discussions, they are generally very sparse at the moment and there's no way of keeping informed (other than submitting a comment, then you get emailed with each update).